Silverstein Family Chiropractic | Helping you achieve your wellness goals! Helping you achieve your wellness goals! Optimal Health: I thought I had that…. 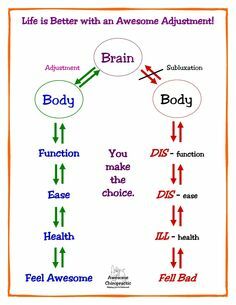 When people ask me why I get adjusted I always tell them, “Optimal Health”. Their response typically sounds something like – what do you mean, don’t I already have that? I don’t get adjusted because I want my low back pain to go away, or my neck pain to dissipate, although those are wonderful “side affects”. I am more concerned with my body’s ability to function – why isn’t everyone else? Research shows that the weight of a dime on a spinal nerve will decrease the function of that nerve by up to 60%. If that continues over time, not only will the nerve degenerate but the organ connected to that nerve as well. I don’t know about your brain, but if it’s a typical brain like mine, the brain will send around 300 million messages coursing down the spinal cord in speeds up to 170 mph. Imagine receiving only 1,200,000 messages! Imagine someone owing you 300 million dollars and only paying you 1,200,000, wouldn’t you feel a deficit? Do you think our body does? I, unlike some of my friends, do not want to live as long as a I can thinking “I’m just going to die someday anyway”…. I want to live in such a way that my body doesn’t have to live with the damaging affects of my lifestyle but ages as gracefully as possible. I want to turn my head when I drive, not my whole body, and ultimately I’d like my organs to function as close to 100% as possible. 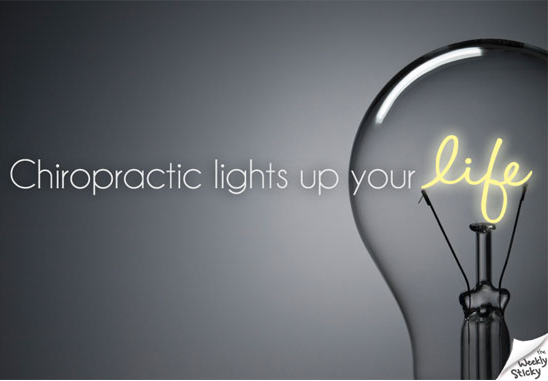 Whats the BIG idea behind Chiropractic Care? If you ask most people what chiropractors do, they say that we treat back and neck pain, and headaches. Although chiropractic care has great results with these conditions, it is so much more than that! C hiropractic is important for your over-all general health and well-being. Chiropractors address your Spine which protects your nervous system! Your body has a master control system, much like the fuse box providing energy to run your home’s electric system. When a chiropractor checks your spine, they are looking for the fuse switches that have been thrown off by stress! Stress, you ask? Physical stress, such as slips, falls, automobile accidents; Mental and emotional stress, such as financial, work; and Chemical or Toxic stress, such as preservatives in food, alcohol and other drugs. “But,” you may say, “stress is a constant! We have stress all the time!” That’s right. That’s why continuous chiropractic care is so important for a healthy lifestyle. If your spine is stressed all the time, your nervous system in turn is throwing fuses! Unlike medical care which is strictly “sick” care. Chiropractic is proactive to keep you healthy so that you don’t have to become a customer of sick care.